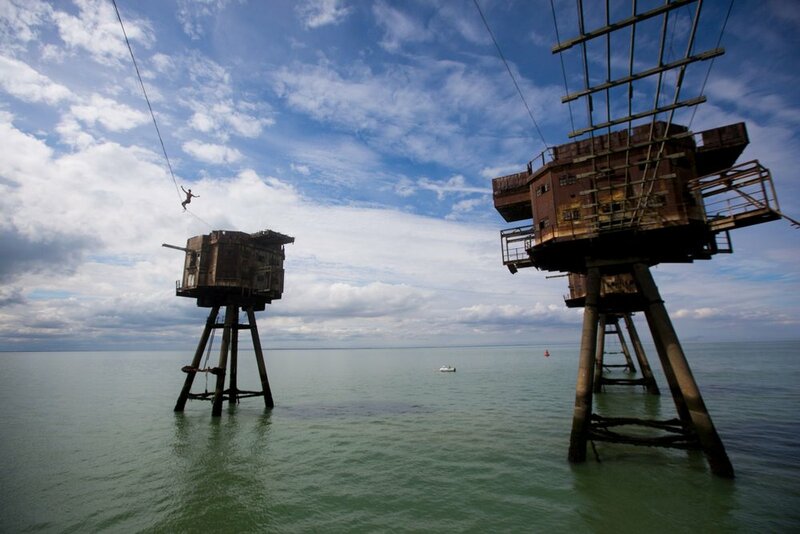 Some years ago when we happened to see pictures of the Maunsell Forts for the first time, we were immediately fascinated by these strange towers made of steel and concrete. Built as war gadgets they look like sculptures from Waterworld or Starwars. They were used in defense of German air strikes and of enemy naval forces invading the Thames estuary. After the second world war they were of various use; they even served as a pirate radio station during the sixties. 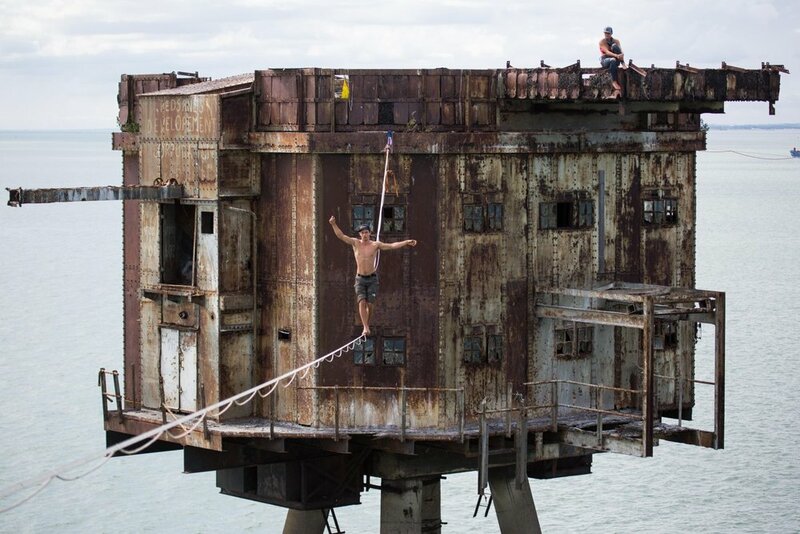 Our thoughts circled around this fascinating and historic place and what we could do to be able to experience a slackline adventure there. In the end things came together and especially with the help of our friend Dan Hunt from London the realization of this unique slackline project came closer and closer. In August we could finally set off. After unbelievably difficult planning, lots of telephone calls, authorization, organization of logistics and other uncertainties we could drive to England in two fully packed cars. Hardly had we arrived in London than we realized that this wasn't going to be an ordinary highline trip, in the sense that a highline trip can be ordinary at all. We spent the first night in two sailing boats at St. Katherine Dock in the city center of London. From there we set off to the Maunsell Forts in the sailing boats of our two friends Dan Hunt and Dave Dykes with a stop in Queensborrow, where we brought equipment and food onto the ferry. The trip on the sailing boats itself was already great fun, however, when we noticed the approaching silhouettes of the forts at the horizon, we became euphoric. So we would be spending the next eight days in these metal structures, cut off from civilization. On the second day we started rigging the highlines. The first one was 30m long from the main fort to the middle fort. It was the easiest line to be rigged as one could reach the other fort across the derelict suspension bridge. Yet, you felt a little uneasy crossing the bridge as it could have broken easily in some parts. For connections Marinus had constructed a monstrous slingshot: 3-4 meters long, very strong rubber bands and our own pulley system Cobra 2 for tensioning. After some initial problems everything worked well and the connection for the 50m was shot successfully. The 50m and 90m highlines were set up on the next day. The forts were climbed in teams of two, which was quite tricky as everything you could use for climbing was more or less rusty. Still, both teams managed to get to the top without any big problems. In the evening there was already the first joint sunset session. Watching Alex bounce heavily on the 90m highline in front of the sunset surely was a memorable experience! Although the highlines were 20m high, they felt pleasant because of the water below. Rocky environment is normally more intimidating. Yet due to the strong currents the water wasn't less dangerous. In the following days a rope swing and a space tent were rigged additionally. The rope swing was fixed to the 50m highline, while we jumped from the suspension bridge. Maggie dared to do the first jump, followed by Niklas and Friedi. Unfortunately not all of the group were able to jump as from the next day on the space tent was in the way. The space tent lay between three forts and offered room for two people. After all parts had had their backups, you could even sleep in it. What a strange feeling, if you not only hear the wind whistle through the tarpaulin but also feel the swinging of the whole structure. In addition you shouldn't worry about the cold water and the strong current below, neither. The good mood, however, soon suffered a little setback. The generator stopped working and a bad weather front made the date of our return become insecure. The generator was the smaller problem as GoalZero equipped us with eight solar panels and two huge batteries, which provided us with electrical power. But the bad weather front worried us a lot more. When two army helicopters raced towards us in a low-level flight and an abseiling action began, we thought this was the end of our slackline adventure. However, they disappeared as quickly as they had arrived, probably surprised when seeing the highlines and the tent rigged in the air. On the other hand walking through the forts on your own and realizing at which historic scene we stayed, you often had a depressed feeling imagining the British soldiers fighting the Nazi attacks from here. The soldiers were literally trapped on these steal forts. But those thoughts never stayed long. In general the mood was bright. Cooking and eating together, watching shooting stars and highlining simply makes you happy. The feeling for time was gone quickly and also the rest of the world seemed so far away. You lived in the moment and enjoyed what you just had. In the end we managed to bring everything back to the sailing boats, even if we were soaked and the engine of the little jolly boat had stopped working.